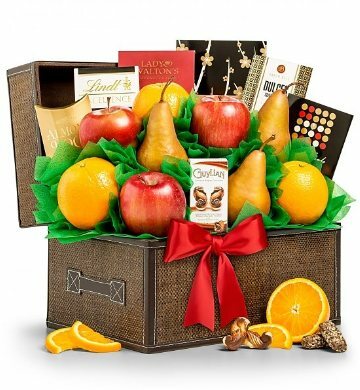 Imagine the surprise of the fruit lover when they receive this charming chest generously filled with fruit-themed confections and premium, farm-fresh fruits! This gift Includes the following: 3 NW Fuji Apples, 3 Bosc Pears, 3 California Navel Oranges, Aaron Bell Seasoned Pretzels, Guylian Artisanal Belgian Chocolates, Toffee Peanuts, Almond Roca, Lindt Dark Chocolate Orange Bar, Sour Cherry Candy, White Chocolate Amaretto Wafer Cookies . Simply delicious! Measures 13" x 9" x 9" and weighs approximately 10 lbs.